The Anishinaabeg (Ojibwe, Odawa, Potowatomi) have always revered the island of Michilimackinac. So much so that at the conclusion of the War of 1812, the Odawa tried to keep it in their possession. The Odawa suggested that the British negotiators offer the Americans a greater quantity of Anishinaabe land on the mainland in order to keep Michilimackinac in the possession of the Anishinaabeg with trading access allowed to the British. We know that this did not happen, but was it possible? This is the second in a series of posts that explore this question. Last month I examined Michilimackinac’s importance for Anishinaabe peoples. Today’s post addresses British policy as explained to the Anishinaabeg in Council. In the final installment in the series, I will focus on Anishinaabe reactions to the news that Great Britain and USA had entered into a peace treaty. Prior to the War of 1812 General Brock understood that there were not enough British forces to defend the Canadas. He knew that the only chance to defend the colonies was to enlist the aid of the Native peoples, including the Western Confederacy and the Six Nations. General Brock reported to his superiors that if the British were able to quickly strike and gain Michilimackinac and Detroit, this would allay the suspicions of the chiefs and warriors who no longer trusted the British because of their conduct at the Battle of Fallen Timbers in 1796 on the Maumee River. The chiefs remembered, and constantly recalled, the disastrous consequences when the Americans overpowered the Western confederacy and the British abandoned the retreating Anishinaabeg by locking the gates to the fort. Brock had to win back their trust and he planned to do this by fighting alongside the Anishinaabeg. Just as Brock had predicted, the quick victory at Michilimackinac brought many more of the western nations to the battlefield. My Father – When you formerly undertook a game with the Americans you invited us to take a [show] in the [sport] after exerting yourself to the utmost you were thrown on your back and we alone were left to support the [weight] of the contest as a proof of which throw your eyes in every direction and you will behold the bones of our friends scattered on the [plains]. Odawa Chief Giiminiijaagan made special reference to the British abandoning the alliance and thus leaving the Western Confederacy to fight the Americans on their own. Despite their expressed trepidation, some of the Odawa, and many Ojibwe proceeded to Detroit where they were victorious once again. After seemingly securing the alliance with the Western Confederacy and the Six Nations, Brock was informed that Prevost, his commanding officer, had entered into an armistice with General Dearborn of the United States. This created an aura of suspicion and perhaps of déjà vu for the Western Confederacy but Brock quickly pledged that Britain would not enter into peace negotiations without consulting them and pursuing their interests. My Children – It is now a long time since you were adopted by me as my Children – Remember Sir William Johnson, he told you I never would forsake or abandon you, but on the Contrary,… I have not nor will I lose hold of the Belt which has been so long among you from Sir William Johnson – on the contrary, I will now make it stronger by the belt which I now present to you, and never will I leave you but as, Your Father, see that Justice is done to you by the Big Knives and that your hunting Grounds shall be preserved for your use,… My Children, listen not to the Songs of wild birds who may tell you that the English will make Peace with the Enemy when it suits their own convenience without consulting your Interest. My words are pledged to you that this will never happen. The belt that was offered to the confederacy was to strengthen the original belt given by Sir William Johnson. Secondly, the Nations’ lands were to be restored to them as their property. And finally, they cautioned the chiefs and warriors against listening to people who would cause dissension by stating that the English would enter into a peace when it suited them and sell out their allies. This last sentiment would be stated again, but by Sir George Prevost. News travelled slower then but in June 1814 news eventually reached Michilimackinac that Great Britain had dealt Napoleon a severe blow and would soon be able to dedicate more resources to Upper Canada to fight the Americans. The commanding officer at Michilimackinac, Lt. Colonel McDouall, assembled the various nations and their chiefs, orators and warriors and told them to expect reinforcements from their Great Father across the great salt water. McDouall also stressed that the Americans had also heard the news and were “trembl[ing]” at the thought of the reinforcements arriving. My Children – […] the power of the Enemy is on the decline, and instead of intimidating your young men, should inspire them with fresh courage to get back their old boundaries, and restore the days of plenty and Happiness among [you]. Listen again my children – the time is at hand when these great blessings can be recovered. My Children – Should the King your Great Father deign to listen to the proposals which the Enemy have made for peace, it will be on the express condition that your interests shall be first considered, your just claims admitted and no infringement of your rights permitted in future (emphasis added). My Children – Doubt not but this will be the case. The King your Great Father has assured you, that he will never abandon his red children, whom he has so long fostered and adopted. The Great Chief at Quebec, Sir George Prevost has also given his word to the same effect, this ought to set your minds at rest upon the subject, for they are not the promises of the faithless Americans but of those who hate duplicity and falsehood. The chiefs and warriors of the Western Confederacy were repeatedly told that their interests would not be forgotten when peace was made. They were told this by Brock, Prevost, Dickson and McDouall. However, Brock was dead, Prevost would soon be, Lieutenant Colonel McDouall and Robert Dickson were not high enough rank to influence British policy nor its diplomacy. Great Britain was tired of the war and its expenses and wanted out. This was the context in which commissioners were sent to Ghent to conclude a peace treaty. The British commissioners later reported that they had insisted to the American Commissioners that “they were not authorized to conclude a Treaty of Peace which did not embrace the Indians as allies of His Britan[nic] Majesty and that the establishment of a definitive boundary of the Indian Territory was necessary to secure a permanent peace, not only with the Indians but also between the United States and Great Britain.” The British commissioners also reported that the American commissioners flat out rejected this provision and that no peace would be concluded on such terms. At the threat of continued war, the British commissioners acquiesced and signed the Treaty of Ghent on December 24th, 1814. All territory, places, and possessions whatsoever, taken by either party from the other, during the war, or which may be taken after the signing of this treaty, excepting only the islands hereinafter mentioned, shall be restored without delay, […] such of the islands in the Bay of Passamaquoddy as are claimed by both parties, shall remain in possession of the party in whose occupation they may be at the time of the exchange of the ratifications of this treaty, until the decision respecting the title of the said islands shall have been made in conformity with the fourth article of this treaty. No disposition made by this treaty, as to such possession of the islands and territories claimed by both parties, shall, in any manner whatever, be construed to affect the right of either. This first article betrayed the trust the Western confederacy placed in the representatives of the Crown. The Western Confederacy captured and defended the island of Michilimackinac, an island that they had repeatedly stated was important for spiritual, political and economic reasons. Since the confederacy captured the island and fort as a conquest of war, and furthermore, successfully defended the island from the Americans’ effort to re-capture it, they could not understand why it was to return to American hands. 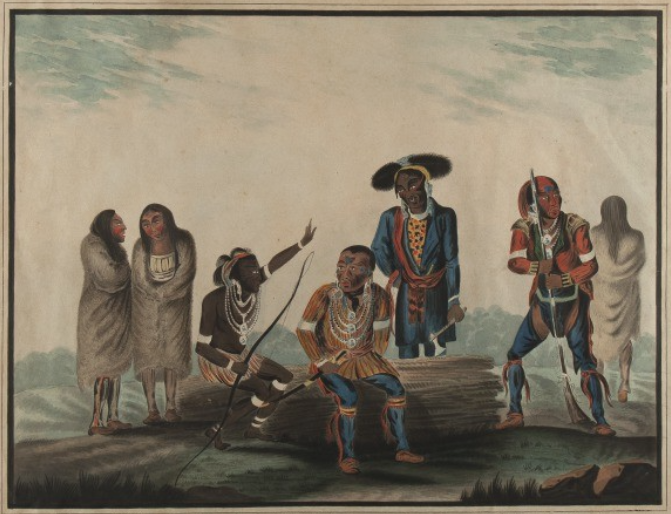 This post is the fifth in a series of essays on Anishinaabeg participation in the War of 1812. They were previously published at ActiveHistory.ca and, in a modified version, in the Ojibway Cultural Foundation newsletter. You will be able to find the rest of the essays here. Minutes of a council held at Michilimackinac by Capt Roberts, Commandant with the Ottawa [Odawa] Indians, 23 August 1812, LAC RG 10, Vol. 28, C-11007, p. 16400 – 16004. Extract of a letter from the Right Honble Earl Bathurst [to] Lt Genl Sir George Prevost Bart dated Downing Street [the] 9th Decr 1812. RG 10, Vol. 3, p. 1553. To each of the tribes of Indians whom Mr. Dickson may have occasion to address /signed/ Francis De Rottenburg, M General, Montreal 18 January 1813, Signed John Johnson, I.G. & S. G. I. A., True Copy, W. Claus DIGS Ind. Affs, McCord Museum of Canadian History, M640. Speech of His Excellency Sir George Prevost, Baronet, Governor in Chief and Commander of the Forces in British North America, to the Deputation of Chiefs and Warriors of the Western Nations in a council held at Quebec on Thursday the 17th March 1814. RG10, Vol. 12, pp: 10313 – 10316, C-11001. Speech Delivered by Lieut Colonel Macdouall to the Chiefs & Warriors at Michilimackinac, 5th June 1814, LAC RG 10, Vol. 28, pp: 16506 – 16511. Extract of a letter from the Right Honble Earl Bathurst [to] Lt Genl Sir George Prevost Bart. True Copy York 1 March 1815 D. Cameron [Asst] Secy, LAC RG 10, Vol. 3, p. 155. Collections of the State Historical Society of Wisconsin Vol. Xlll pp: 143 – 145. Featured Image: “Deputation of Indians from the Mississippi Tribes to the Governor General of British North America, Sir George Prevost. Baronet. Lieut. General, [etc.] in 1814” by Rudolf Von Steiger. Missouri History Museum via Digital Public Library of America. We need to re-do Cdn history taught to our children so the important points in this article are included!